Coffee and tea service following dinner is an area where some venues get it right and others consider as an afterthought. I've seen some venues offer coffee and tea service to all of their guests at their tables immediately after dinner and then serve their coffee and tea on a silver tray. It's a nice way of continuing the fine service that has been offered throughout the evening. Sugar sticks and maybe a mint on the saucer is a nice little addition to the service as well. I've recently stumbled across a new product that can be added to your tea service. 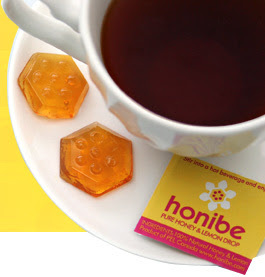 Honibe's Honey Drop™, is "the world's first pure, non-sticky honey that you can hold". I think wedding guests dressed in their nice attire would all approve! I know I do! Maybe, someone can even add that to my stocking as a stocking stuffer this year!